If anything, Washington State's extraordinary guitarist Damon Buxton is a pragmatist. Even though his compositions run way past the concept of simplicity, his titles bear the names of everyday themes. This is Damon's fourth solo album to date and it puts him in storytelling mode. We see snippets of family and friends and the things that give lasting impressions. He takes these observations and translates them into music that is filled with color and depth, style and creativity. The album, to me, is like a friend coming over, sitting on the porch, and having a musical conversation. At first it is one sided of course, since Buxton has the guitar. But then, we get comfortable. Things begin to get familiar. The exchange seems to balance out as the evening goes by and my imagination responds equally to the music. This album, Visitation, like the conversation, is one to remember and replay over and again. The music of Lighter Than Yesterday sort of sits back and looks over the situation. It is a comparison between then and now. Now seems to always win. As a writer, I see my life as pages in a book. The book gets thicker every year. Damon chronicles his journey in music, one song more complex than the next, but each consecutive song builds on the experience of the last. Eventually you have a chain of events and a story written in music. Damon is a believer. The album has little revelations along the way that confirms it. The title tells that. The cover art shows that. Two angels are almost sitting on his shoulders on the back cover. I tend to agree that there are unseen forces radiating positives energy in our lives. We can label them anything handy, but the fact remains that there are supernatural helpers out there. Damon's guitar sings for his muse on The Constancy of Angels (For Ash). It is no coincidence that the tune is lighter than air and ethereal as cirrus clouds. Sometimes the guardians in our life are looking down from a mountaintop, and other times, they are just a handhold away. Carrying the believer theme over one more time is the title tune, Visitations , the evidence so to speak of the presence of unseen forces. Now Damon readily admits that these forces may not all be good. They may be mixed in somewhere in the haunting dream, the string of bad luck or even the unforeseen change in someone’s life. The answer may be in the thought that there ought to be at least a balance of good and evil in our world. Maledictions , a rather somber tune, had a series of notes running through it that reminded me of a string of barbed wire. Every lead note was a point on a barb, drawing attention and sometimes blood. I know it is somewhat macabre, but that is the image that formed in my mind after about ten listens. Sometimes your path is fraught with evil, and at other times, the fence keeps you on the path. The final tune, Between the Clouds , brings back a lighter sense to the music. At this very moment, my sky has grand cumulus clouds over head. It only takes a moment for my imagination to build a scene or a figure from the white fluffiness. There are times however, when the blue of the sky overpowers the senses and gives pause to my thoughts. The feeling is one of anticipation. What comes next? 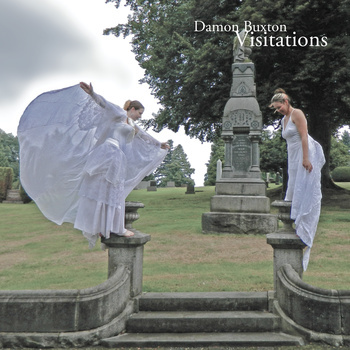 Like all the Damon Buxton offerings, Visitations is carefully crafted to take advantage of a theme. Musically, Damon delights in the things he has seen and those things that are unseen. Somehow, he translates his music into faith. The album has fourteen contemporary tunes that have delighted me repeatedly. You can anticipate no less.